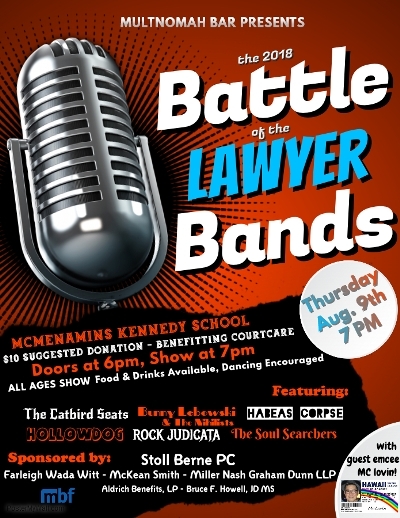 Join the MBA Events Committee at the McMenamins Kennedy School for this CourtCare fundraiser. Bands comprised of at least one Oregon lawyer will compete for the title of “Best Oregon Lawyer Band 2018.” Judges from the MBA legal community will decide the winner at the end of all the performances. Bring your family and friends and cheer for your favorite band! Crowd applause and interaction will be one of the criteria on which judging is based, in addition to the Audience Choice Award. Suggested donation: $10.